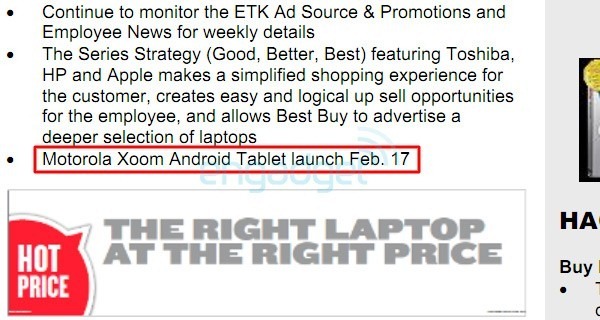 An eager reader forwarded an internal Best Buy memo to Engadget which indicates, in no uncertain terms, that the Motorola XOOM tablet is set to launch at Best Buy on February 17th. 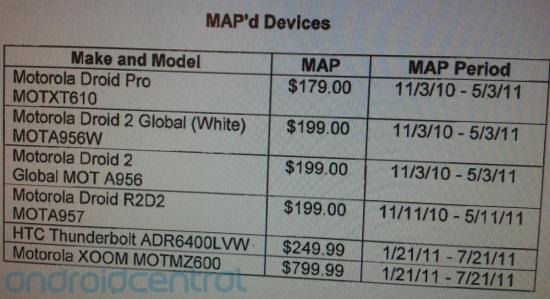 A leak from Verizon has confirmed that the unsubsidized price of the XOOM will be $799. However, Best Buy may be retailing the device for an altogether different price. The XOOM is an important device for both Motorola and Google because it will be the first tablet to run Android 3.0 Honeycomb, an iteration of the Android OS that supports the tablet form factor. Google rubber-stamped their approval over this product when Andy Rubin demoed Honeycomb on the XOOM at AllThingsD's D:Dive Into Mobile. So, even though the Samsung Galaxy Tab is currently the best Android tablet, it is running Android 2.2 Froyo, which is not optimized for tablets. Finally, the Galaxy Tab has already sold over a 1 million units. In contrast, Motorola estimates sales of the XOOM to reach a modest 700,000 to 800,000 units in Q1 2011. We will have to wait till February 17 to see how popular the XOOM really is.